de Dorothy J. Blum Ed.D., Tamara E. Davis Ed.D. 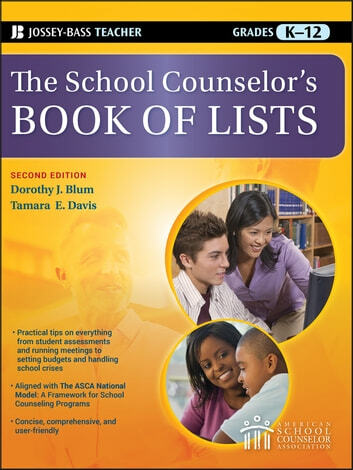 Since 1997 The School Counselor's Book of Lists has offered counselors a wealth of relevant and much-needed information written in concise and user-friendly language. A quick, easy guide for finding information on almost any topic pertinent to school counselors, the book covers everything from writing student assessments and dealing with school crises to setting budgets and running effective meetings. In order to address the transformed role of school counselors, the contents of this comprehensive second edition map to the American School Counselor Association's National Model for Counseling Programs. This revised edition is appropriate for school counseling graduate programs as well as to practitioners in the K-12 field. por Dorothy J. Blum Ed.D.,Tamara E. Davis Ed.D.